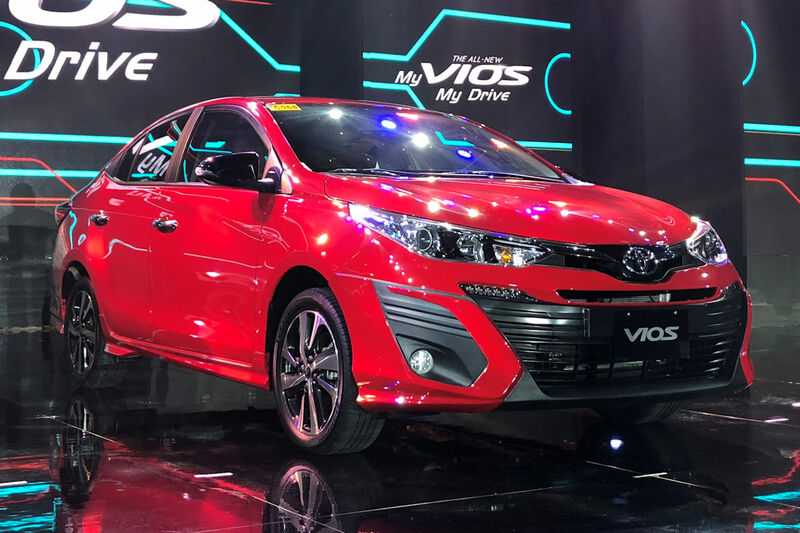 The launch of the all-new 2018 Toyota Vios comes at the heels of the brand’s 30th anniversary in the Philippines, as well its record achievement of 1.5 million in cumulative sales in the course of those three decades. The Vios is undoubtedly one of the breakthrough models for Toyota Motor Philippines since its launch in 2003. 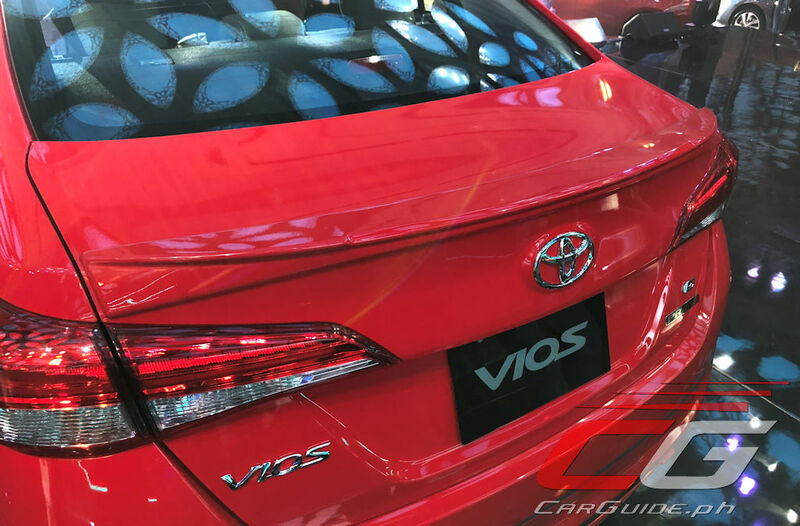 By the release of the second generation, the Vios was already proudly Philippine-made. Currently, the Vios holds a commanding 43.4 percent market share of the sub-compact segment, selling 36,700 units in 2017 alone. It’s worth noting that the entire sub-compact segment is at 85,000 units. As 2018 entered and Toyota Motor Philippines began to phase out the outgoing model, the Vios still managed a strong 11 percent market share of the sub-compact segment in June. They sold around 600 units to the segment’s 5,000 units. The Vios’ target market is 30-39 years old, predominantly male (60 percent), and married (68 percent). They’ll have an average household income of P 80,000 to P 85,000 per month. 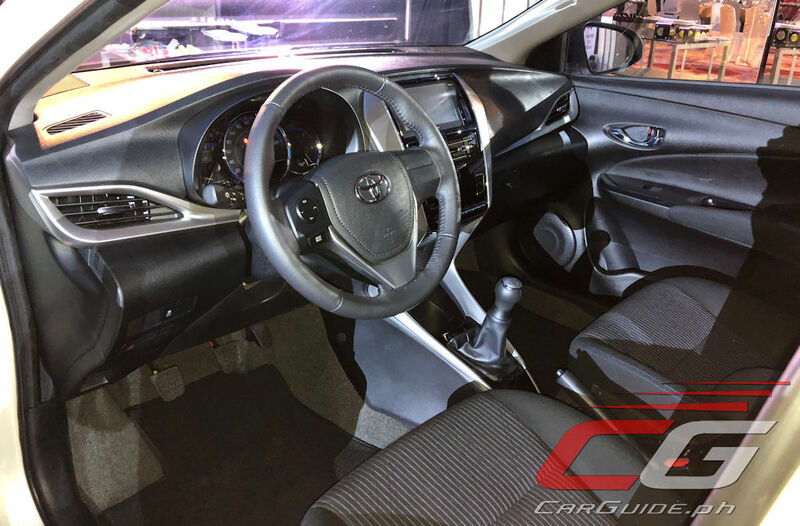 According to Toyota Motor Philippines’s market research, the primary reason for why buyers choose the Vios is exterior styling (17 percent) followed by fuel economy (13 percent), and riding comfort (13 percent). 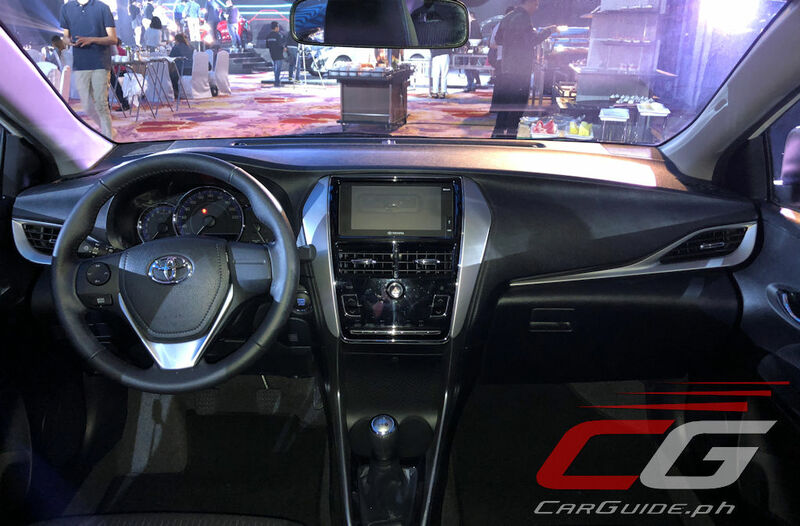 The huge consideration for style is the reason why Toyota introduced the “Prime” variants. There is an additional tag of around P 50,000 to upgrade to the Prime variants (compared to the 1.3 E and 1.5 G). The top up that makes a Prime variant covers: add-on exterior features that make the Vios look, well, less regular. 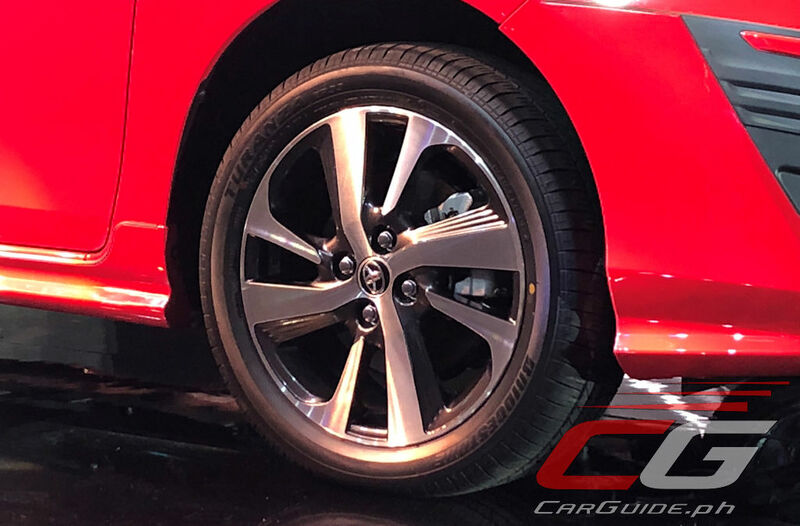 This includes a sportier front and rear bumpers, a rear spoiler, and a set of bigger two-toned 16-inch alloy wheels (195/60 R 16) for the 1.5 G Prime. Questioned as to why the Vios sees a price increase with every succeeding generation, Mr. Takatomo Suzuki, Vios Chief Engineer, explained that while it’s positioned as an Entry-level Family Car (EFC), the needs of the family have changed greatly since 2010. Today, the Vios market has evolved towards a greater desire for fashion, self-expression, and dynamism through the car that they drive. 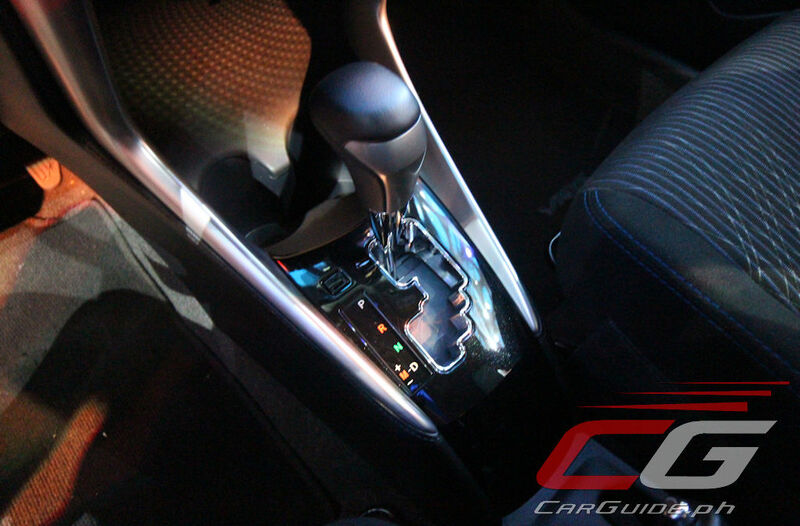 The Vios had to match those needs with its sportier styling and enhanced equipment level. 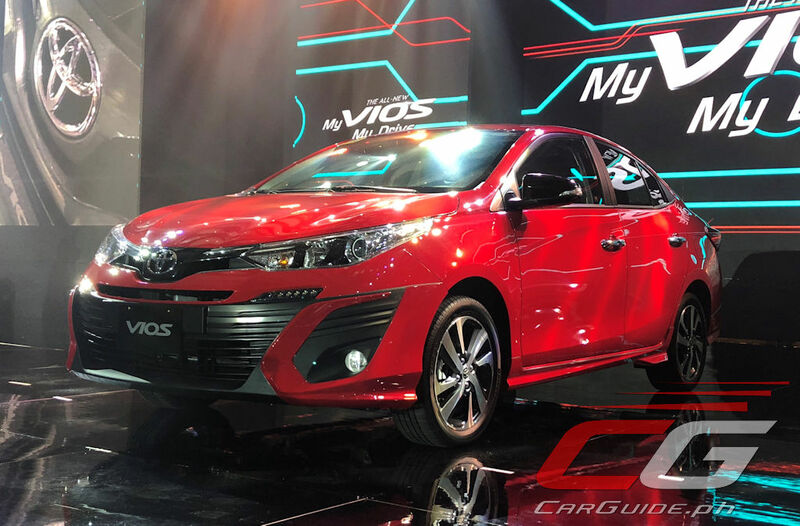 Enrolled as part of the government’s Comprehensive Automotive Resurgence Strategy or CARS Program, Toyota is committed to churn out 200,000 units of Vios models within the next 6 years. They are confident of achieving this target with no need to add more derivative models of the Vios. 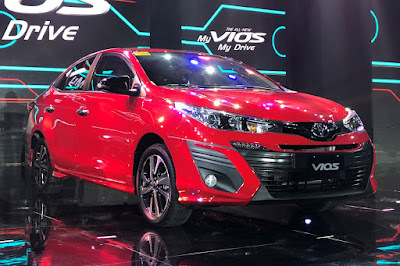 According to Mr. Satoru Suzuki, President of Toyota Motor Philippines, the all-new Vios is manufactured with 40 percent local content; 50 percent if you count the assembly cost. Toyota estimates they’ll be able to sell 3,500 units per month. The Vios’s engine line-up is carried over from the previous model, but a calibrated transmission software should make it more responsive. 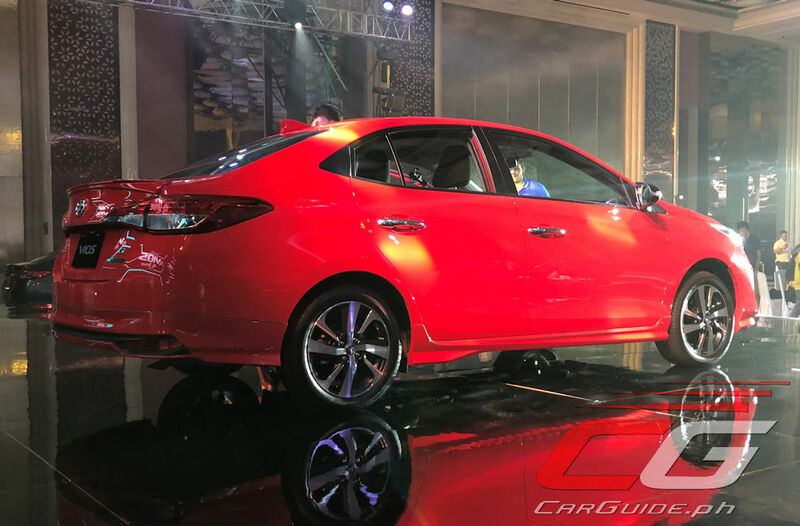 The platform is also from the previous Vios, but additional welds make it much more rigid. There’s also a lot of emphasis on NVH. It sees an 11 percent improvement based on Toyota’s estimates. The dashboard alone gets 40 percent more sound insulation than before. Emphasizing safety, all model variants of the Vios get 7 airbags, ABS with EBD, and vehicle stability control as standard. With that, it scores a perfect 5-star ASEAN NCAP (New Car Assessment Program) safety rating. 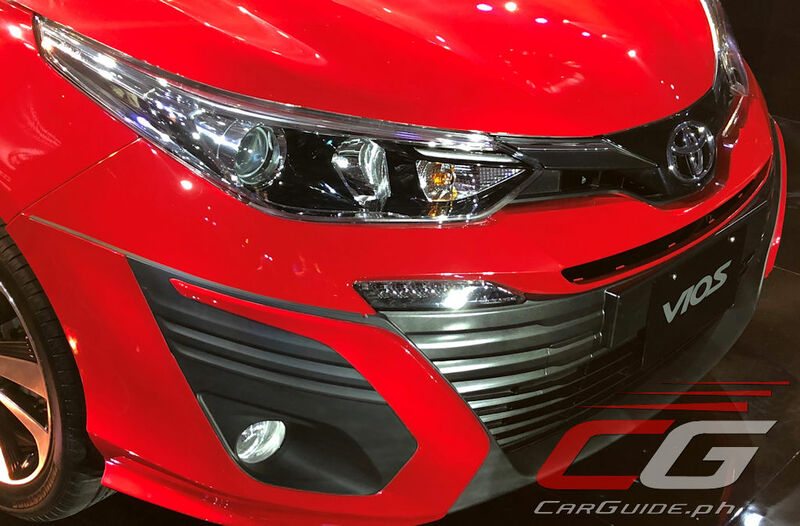 There are 9 colors for the 2018 Vios: Super Red, Grayish Blue Mica Metallic, Freedom White, Alumina Jade Metallic, Blackish Red Mica, Thermalyte, White Pearl, Red Mica Metallic, and Black. There are 9 variants as well: prices start at P 659,000 for the 1.3 Base M/T, moving up to P 878,000 for the 1.3 E CVT, then at P883,000 and P933,000 respectively for the 1.3 E Prime M/T and 1.3 E Prime CVT. 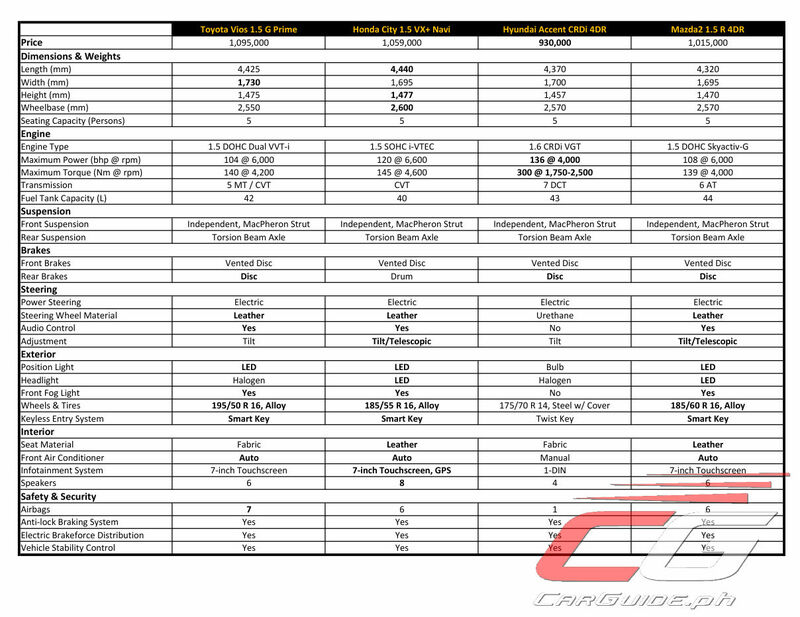 The 1.5 G variants start at P 981,000 for the 1.5 G M/T and P 1,040,000 for the 1.5 G CVT. It tops off at P1,095,000 for the 1.5 G Prime CVT. Of course, there’s some curiosity as to how the 2018 Vios stacks up against the competition and in the tables below, the top-spec 1.5 G Prime goes against the Honda City 1.5 VX+ Navi, Hyundai Accent CRDi 4DR, and Mazda2 1.5 R 4DR. Meanwhile, the fleet-friendly 1.3 E goes against the Accent 1.4 GL, Suzuki Dzire 1.2 GL+, and Volkswagen Santana 1.4 MPI. With reporting by Gen Tiu. The 1.5L variants maybe tough in terms of pricing as compared with its older sibling, the Altis. 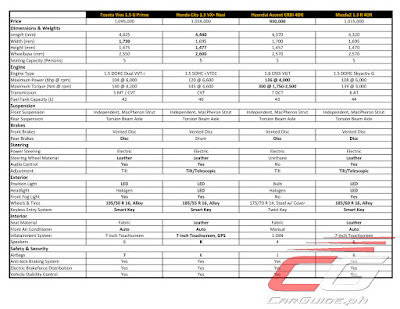 981k for Vios 1.5G M/T vs. 997k for Altis 1.6G M/T (16k difference); 1.04M for Vios 1.5G CVT vs. 1.053M for Altis 1.6G CVT (13k difference) and 1.095M for Vios 1.5G Prime CVT vs. 1.131M for Altis 1.6V CVT (36k difference). 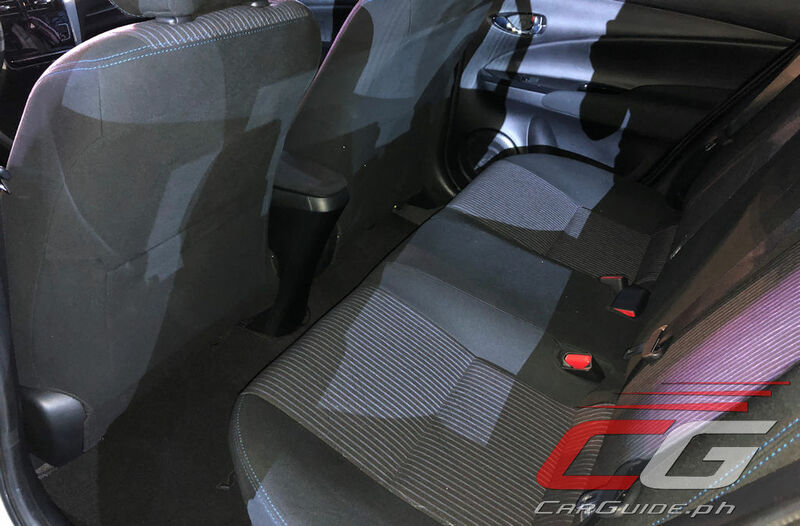 In terms of safety, Altis also has side, curtain and knee airbags all throughout their variants aside from the driver and passenger airbags. Since the so-called new Vios retains the same engine, the 1.6L engine on Altis is definitely much better specwise and fun to drive. At the same time, Altis has more ample space than its younger sibling. 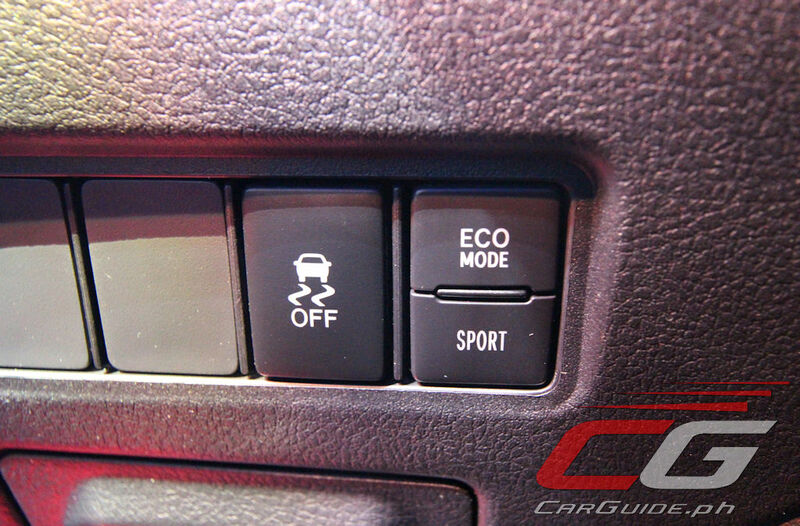 Unless, you want stability control in your car, by all means go get the new Vios.